The embattled Santa Clara County jail is back in the spotlight Monday after two sheriff's correctional deputies self surrendered for an alleged beating of an inmate. Sgt. 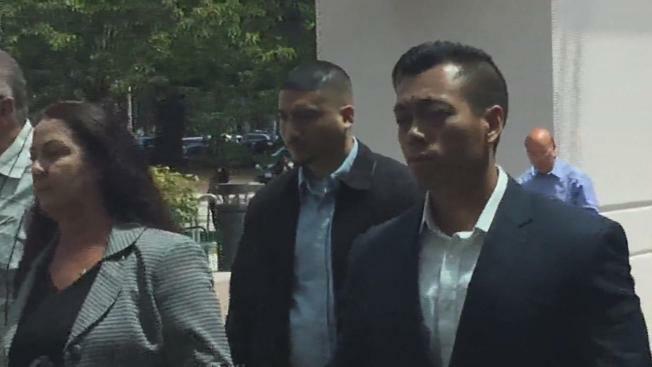 James Jensen said Phillip Abecendario and Tuan Le will be charged with assault and a three-year jail sentence could be on tap if the the men are convicted. The arrests of the deputies culminated a long investigation by the sheriff's department. As NBC Bay Area reported, inmate Ruben Garcia said he was severely beaten by two deputies in July 2015. Garcia was assaulted in an interview room and then dragged "chained and half-naked" before being kicked and punched back in his cell, according to the district attorney's office. "My client is, of course, happy about it in some sense ... but it's not going to be the restitution that he'd really needs for the injuries he suffered because they're 'life altering'," said Robert Powell, Garcia's attorney. Subsequent investigation revealed that at least two dozen inmates saw at least part of the incident, Deputy District Attorney John Chase said. The officers filed no reports documenting or explaining why they used force, Chase said. Both deputies have been on administrative leave since February. Garcia filed a lawsuit against the county and the two accused deputies. He said the incident happened about a month before fellow inmate Michael Tyree was beaten to death in August 2015, allegedly by three guards. Those guards are facing murder charges in that case. Garcia remained skeptical about his case even after Monday's arrests. "I'm not confident about it because they're in a position where it gets swept under the rug or they take a lesser charge or whatever," he said. Garcia told NBC Bay Area then that he filed the lawsuit because the deputies had broken his jaw and caused permanent nerve damage. But right now the focus is on the criminal case. "We can't have jail guards administering their own form of punishment to inmates who are waiting for their trials or serving their sentences," prosecutor John Chase said. "My main focus is to bring transparency and accountability to the Department and my Association," said Sgt. Amy Le, President-elect of the Santa Clara County Correctional Peace Officers' Association. "I look forward to working with the Sheriff’s Office, the Board of Supervisors and the community to regain public trust. We share a responsibility to make our jails and community safe for everyone."